Collect all the orders and reach 100,000 points to complete the level. This level has hard difficulty. For this level try to play near to blockers or make striped candy as you get the chance. 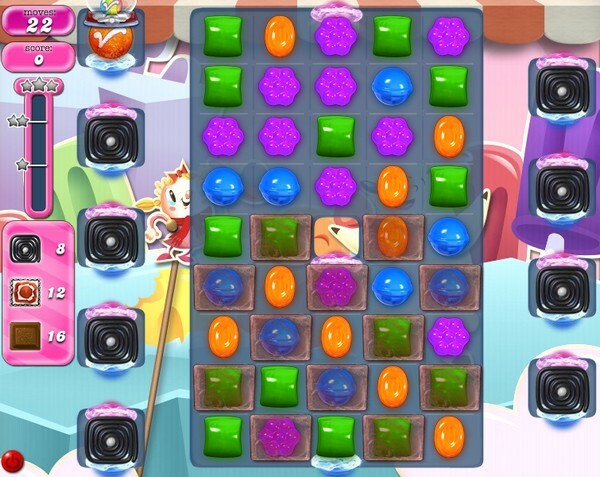 Combine special candies with each other to break the blockers that are in corner part of the board. I finally won when I used a hammer on the top left square. It prevents anything to fall down into the other spaces. I also let the chocolate grow a little before I deleted them. It’s frustrating to say the least. Need help. thanks. I got in in 4 tries. Keep getting the mystery candies to drop, by playing the candies in the main board. I got most of my mystery candies to come to me. I keep kidding myself that CC can’t get anymore difficult but it does!!!! Had enough.